Through the magic of small plates and camera angles, this doesn’t look all that small! 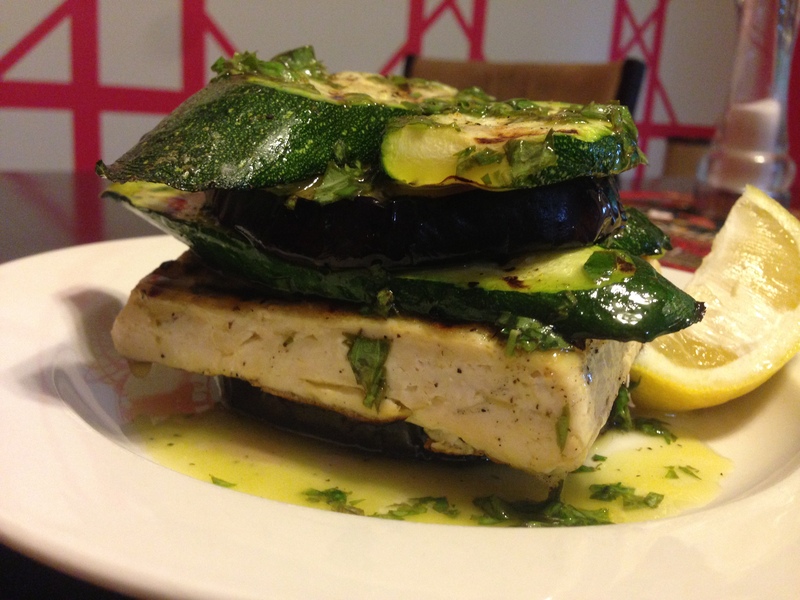 This dish is labeled as a “Meatless Main.” It also gives its calorie information as 175 calories per serving. Now, unless you’re going to have a rather substantial side dish or you’re saving ample room for dessert (good move) or you’re using MyFitnessPal and you find yourself with no more calories left….this is a side salad. That’s how we served it. We had frozen pizza with this as a side. I wound up eating less pizza because this was here, so that’s good. Anyway, I just wanted to point out for you that this is meatless, but it’s probably not much of a main dish as is. On to the more interesting things. 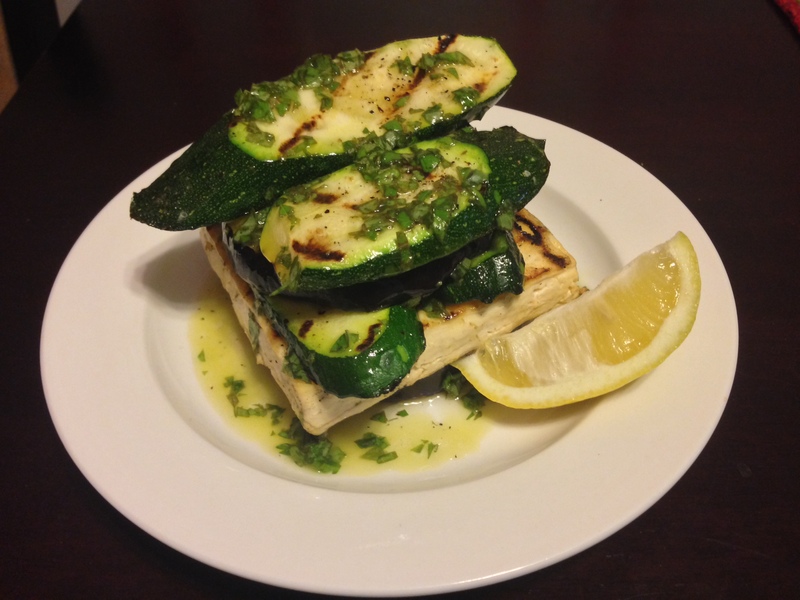 Can you really grill tofu?! Yes! You definitely have to drain it to get it nice and dry. 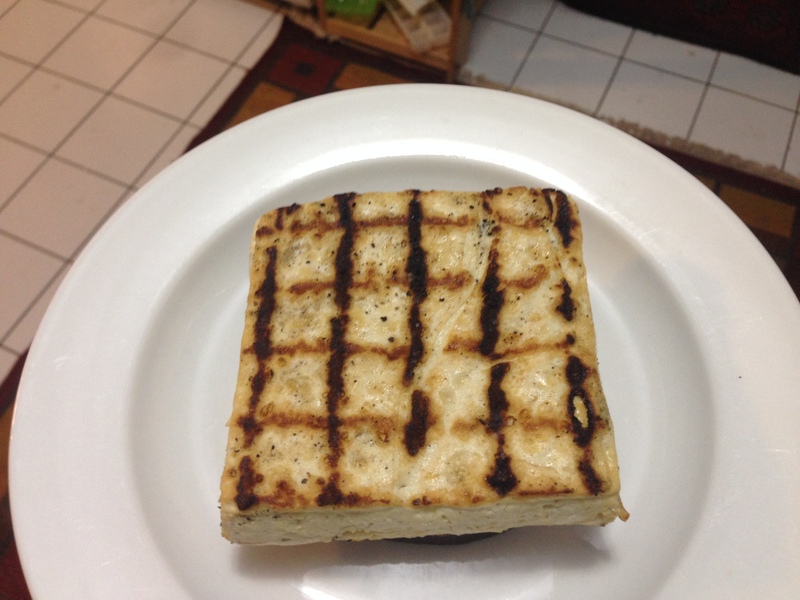 The recipe says to split the block crosswise in four and the picture looks like big slices of tofu, so I took that to mean that you were supposed to cut it horizontally to make, in essence, wide patties of tofu. This made sense from a grilling standpoint. My tofu was wider than your usual block and not quite so tall, so I just cut it once. If I cut it into four big slices, there’s no way they’d have the structural integrity not to fall through the grates. Plus, only two people were eating, so why bother? The veggies also grilled very nicely, and the dressing was awesome. I took some liberties with the dressing. I only had a little bit of parsley, but I have an herb garden in my window that’s producing basil, thyme, and oregano. I chopped up some basil and oregano and added it to the little bit of parsley I already had. That was delicious. It took on more of an Italian flavor. I really enjoyed the earthiness I got from the oregano. Fresh oregano is really pretty awesome, but who wants to bother, right? Right. So I definitely recommend getting creative with your fresh herbs. And here’s the real bonus to getting creative with your herbs…and this is kind of a fat kid move…the dressing is very good on frozen pizza. How do I know? Are you going to make me say it? I dipped my pizza in it. I figure fresh herb, fresh lemon, and olive oil dressing on pizza is the classy version of dipping it in ranch dressing. Whatever. It was good. So please enjoy this side salad or very small main dish or pizza dip. Well, once you notice the lemon wedge for scale, you really do see how small this is.